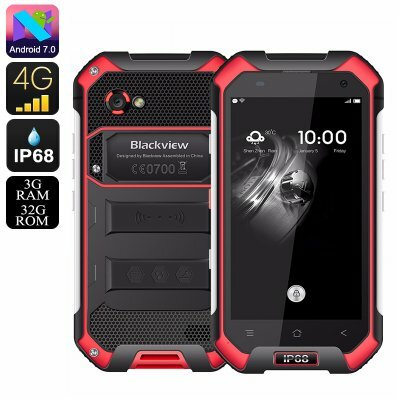 Successfully Added HK Warehouse Blackview BV6000 Rugged Phone - Android 7.0, Dual-IMEI, 4G, Octa-Core CPU, 3GB RAM, IP68, NFC, OTG, 4200mAh (Red) to your Shopping Cart. Stay connected to friends and family while you’re out in the wild with the Blackview BV6000 rugged phone. This Android smartphone features an extremely tough IP68 design. Thanks to this, you’ll no longer have to worry about dropping your device or making it wet. Its body protects the phone fully against water, drops, dust, and more. No matter what you throw at it, this rugged smartphone is virtually indestructible. Thanks to its rugged design and GPS and SOS features, this Android phone is the perfect cell phone for outdoor enthusiasts. This tough rugged smartphone features Dual-SIM slots and two IMEI numbers. Thanks to this, you’ll always be reachable on two different phone numbers at the same time. Additionally, it supports 4G. With the fastest mobile data speeds at your side, you’ll always stay connected to your loved ones. Stream movies, browse the web and make online calls. Nothing is too much for this waterproof smartphone. On its 4.7-Inch display, you’ll be able to enjoy all your mobile activities in HD resolution. This makes your Android phone perfect for playing games and watching movies. The Blackview BV6000 runs on the latest Android 7 operating system. By treating you with the latest software features, you are guaranteed to enjoy a smooth user experience. Within its body, this rugged phone furthermore packs a powerful Octa-Core CPU. This processor has been clocked at 2.0GHz. Along with 3GB of RAM, this rugged phone lets you tackle the most demanding software without dropping a frame. With access to the play store, you’ll always be able to download your favorite media and games. Its 32GB of internal memory and 64GB SD card slot take away all your worries about running out of storage space. Your rugged smartphone is powered by a 4200mAh battery. This cell provides you with 14 hours of continuous usage time. Additionally, it brings along 80 hours of standby time. From now on you’ll be able to head out with confidence. With this cell phone at your side, you’ll never run out of juice. Thanks to its 13MP rear camera, you’ll even be able to snap breathtaking images during your upcoming adventures.